I like kundru (Ivy gourd or tendli) a lot although my mom used to cook it only like this kundru ki lehsuni bhujia. I remember my research guide Dr. Maya Goyle used to bring a really nice kundru ki subzi and as she would always pack a lunch box for me as well, I have enjoyed a lot of her cooking too. A senior in my lab also used to bring some Tamil style food and that also had some kundru sometimes, the reason was that everyone cooked whatever was in season back then. I have been blessed indeed in matters of food. Later when I made some other versions of kundru in my own kitchen, the flavours were the reminiscences of those lunch boxes we enjoyed together, exchanging recipe notes most of the times. 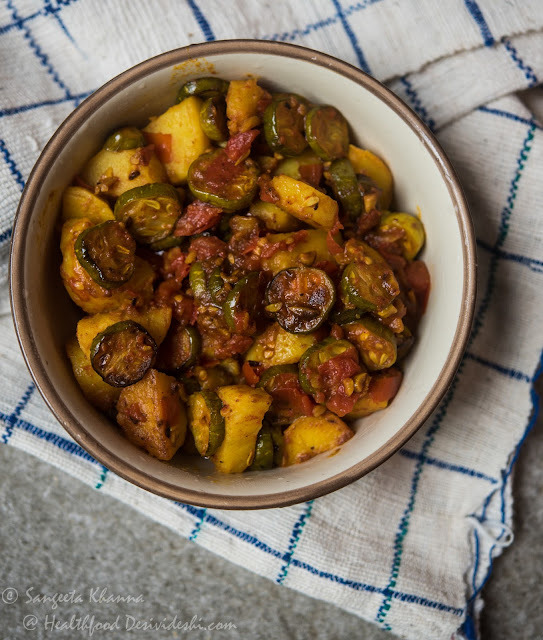 Recently when I tried adding kundru to the potatoes my husband loves in his lunch box, I thought of adding some tomatoes to make it a saucy subzi that can be eaten on its own with boiled eggs. He has stopped taking rotis or rice in his lunch box to keep it light, he thinks a full meal makes him feel sleepy in the office. I agree to that. The saucy kundru ki subzi turned out to be so flavourful that I have been repeating it whenever I see some fresh kundru in the market. Heat the mustard oil in a deep pan and tip in the fenugreek seeds. Add the minced garlic as soon as the fenugreek turns deep brown and aromatic, tip in the sliced kundru over it and toss to mix. Now add the cubed potatoes, toss to mix well. Add the salt, turmeric, pepper and chili powders and mix. Keep tossing for 3-4 minutes till the vegetables look glazed. Now add the tomatoes, mix and cover to cook for 5 minutes on low flame. The tomatoes should get pulpy by the end of 5 minutes. Mix well and sprinkle some water if you need to make it more saucy. Serve as desired. It makes a nice subzi to be served with roti or dal chawal meals, we usually eat it with boiled eggs as a salad for our lunch. The instagram picture will give you an idea how we prefer eating many of subzis. Kundru ki subzi with potatoes and tomatoes is the simplest of recipes I have made till date. Sometimes I just add everything together and cover for 8-10 minutes and give it a good stir in the last step. The subzi tastes great every time. The garlic, chili or paprika and tomatoes make a flavourful base for kundru, which is a slightly tart vegetable and has a great texture too. Ahhh...this recipe made me so homesick. Not sure if it was just the pic or what, but I went out to the Indian shop specially to buy tindora to make it! I'm not sure if tindora and kundru are the same? How sweet K. Tindora is also known as Kundru or Kundri. Tindora and kundru are the same vegetable.